OKLAHOMA CYCLONE (1930, Tiffany) Bob Steele, Nita Ray, Al St. John, Charlie King. Bob plays a cowboy on the run from the law. He falls in with Charlie’s gang, but—not really being a bad guy—he and Charlie are soon at odds. They have one helluva fight at the end of the film. Cool. A little slow at first, but a rousing second half. A very unusual, sad ending. From 16mm. 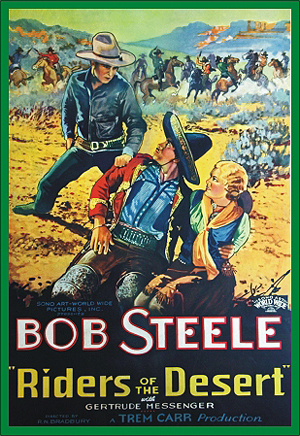 RIDERS OF THE DESERT (1932, World Wide) Bob Steele, Gertie Messenger, Al St. John, Gabby Hayes. It’s Bob against Gabby in this exciting shoot-em-up about robbery, murder, outlaw gangs, and hidden gold. One great scene has Bob trying to save Gertie from a quicksand pit! From 16mm. THE GALLANT FOOL (1933, Monogram) Bob Steele, Arletta Duncan, John Elliott. A slick Steele film with Bob’s Dad being framed for murder! In something out of the ordinary for a ‘30s B western, our heroes take refuge in a circus until they can bring the real killer to justice. When they do—look out! 16mm. THE GUN RANGER (1936, Republic) Bob Steele, Eleanor Stewart, John Merton. Bob’s a lawdog who, along with the rest of the town, awaits a verdict in a murder trial. Everyone is shocked when the killer is freed on a technicality that was set up by his lawyer and a crooked D.A. Bob promises to act as judge, jury, and executioner as he rids the town of the low-lifes. A superior A.W. Hackel production. 35mm.